This article by Martin Bond, Baker Perkins' chief engineer, confectionery, was first published in the November 2012 edition of Confectionery Production magazine. The hard candy depositing process has grown rapidly over the past 20 years. Deposited hard candies and lollipops are made in every major confectionery market around the world by companies ranging from regional specialists to major multi-nationals. Introduced over 50 years ago, depositing was a niche technology until confectioners recognized its potential to meet increasing market demand for high-quality, innovative products that would be inconceivable with traditional processes. Today it continues to progress, offering a widening range of opportunities to blend visual appeal with exciting taste and texture combinations. Candies and lollipops can be made in up to four colours in solid, striped, layered, and centre-filled varieties. All are made in specially coated moulds that impart a uniform size and shape, and a smooth glossy surface finish. They have excellent flavour release and a smooth mouth feel with no sharp edges. An obvious distinguishing feature is the witness mark left by the mould ejector pin - deposited hard candy is so highly regarded as a premium product that some die-formed candies have been marketed with simulated marks. The apparent simplicity of depositing conceals a wealth of detailed knowledge and meticulous engineering that ensue the process is reliable and quality is maintained. Cooked candy syrup is fed continuously to a heated hopper positioned over a chain driven mould circuit. Pistons in the hopper meter the syrup accurately into individual cavities in the moulds, which are then conveyed into a cooling tunnel. Generally the products remain in the mould for the forward and return runs of the circuit before being ejected onto a take-off conveyor. Production of deposited hard candy is highly efficient, with very low scrap rates. Depositing is at final solids so no additional processing is required. Candies can go directly to packaging where they are usually wrapped individually. They will be either flow- or twist-wrapped depending on climatic conditions and required shelf life. The fundamental principles of depositing have remained the same for 50 years. However, technological advances, particularly in control systems, would make modern machines virtually unrecognizable to the pioneers of the process. The first continuous depositors were low output, usually one mould wide, with no more than eight cavities across. These depositors were mechanical with all movements driven by cams linked to the mould circuit. Production from a single hopper was typically between 200 and 500 single colour candies per minute. Today, machines feature sophisticated servo-drives and PLC control systems instead of mechanical cams and linkages. These enable one depositor to be used for a very wide product range, and to be changed over at the touch of a button. Depositors are now up to 1.5 metres wide, often have double hoppers, operate at higher speeds and deposit two, three or four rows of candies on each cycle. The majority of hard candies fall into one of three generic categories – clear candy, cream candy and milk boil (high milk) candy. All these recipes are continuously cooked, typically to a final moisture content of 2.5 to 3%. 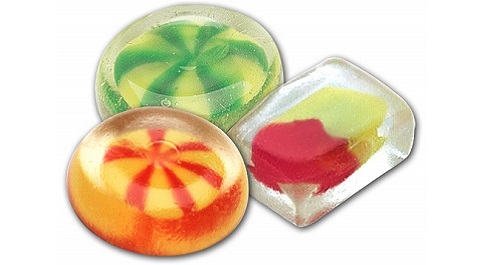 The clear candy recipe is typically used to make coloured fruit-flavoured candies, often with layers or multiple stripes, or clear mint candies. It is also used for many solid or liquid centre-filled products. With the correct raw materials and process, very clear sweets are produced. The cream candy recipe usually contains about 5% cream and is one of the most popular today. It is usually the base for striped fruit and cream candies, of which many types are produced globally. The milk boil recipe is used to produce candies with a high milk content - solid hard candy with a rich, caramelized flavor. Recently, many manufacturers have started to fill these products with real chocolate or soft caramel. Advances in ingredient and cooking technologies have enabled sugar-free candies to be deposited with few problems. The most common sugar-free material is Isomalt. One alternative to making solid sweets is to produce layered candies. There are two alternatives here. For ‘short-term’ layered candy the second layer is deposited immediately after the first layer, partially displacing the first deposit. This can be done on single headed depositors provided there are two candy hoppers. The bottom layer does not have time to set so the top layer sinks into it, creating some interesting effects such as ’coffee cups’ and ‘eyeballs’. The latest method is ‘long-term’ layered candy, which requires a depositor with two or three depositing heads spaced apart ‘Long term’ layering involves a dwell time between each deposit, allowing the first level to partially set before the next one is deposited. This ensures that there is clear separation between deposits giving a true ‘layered’ effect. This physical separation means that each layer can involve different colours, textures and flavours – contrasting or complementary. Lemon and lime, sweet and sour, spicy and sweet are typical. They can be sugar or sugar-free: the most common application is a combination of sugar-free polyol and Xylitol layers. One of the most successful products of recent years has been the striped cream candy which has become truly global. Usually it is produced in two colours, but sometimes made with three or four. For two-colour stripes, there are two hoppers depositing candy through a manifold arrangement. A special stripe nozzle with a series of grooves and holes is fitted in the manifold. One colour is fed directly though the nozzle and out of the nozzle holes. The second colour feeds through the manifold and down the nozzle grooves. The two colours converge at the nozzle tip. For three- and four-colour products, there are additional hoppers, or partitioned hoppers with increasingly complex manifolds and nozzles. Typically these products are made with equal candy weights for each colour but by breaking this convention it is often possible to create unique and innovative products. A centre filling encapsulated in hard candy is an increasingly popular product option and one that can be achieved reliably only by one-shot depositing. The easiest product to make is a hard candy with a hard candy centre, but it is possible to centre-fill with jam, jelly, chocolate or caramel. One hopper is filled with the shell, or case, material; a second hopper is filled with the centre material. As in stripe depositing, a manifold is used to bring the two components together. Typically, the centre will be between 15 and 25% of the total candy weight. A centre-fill inner nozzle is fitted into an outer nozzle. This nozzle assembly is fitted into the manifold directly below the centre hopper. To fully encapsulate the centre, the case material pistons should start to deposit slightly before the centre pistons. The centre is then deposited very quickly, finishing before the case piston. To achieve this effect the case and centre often have very different pump profiles. The technology can be exploited to produce hard-centred confections with contrasting flavours - such as a chocolate flavoured centre within a strawberry and cream outer. The choice of colours and flavours is virtually limitless. A major development has been the expansion of technology for deposited lollipops. The product range is similar to that for conventional hard candies - one, two, three and four colours, with a multi-component capability providing solid, centre-filled, layered and striped options. For ball, spherical and flat lollipops the Baker Perkins ServoForm™ depositor range gives a throughput of over 1,000 lollipops per minute with a product quality identical to deposited candies. The market seems to be dividing into two types of candy manufacturer. There are those that want dedicated lines to make just one product. These depositors need to operate extremely efficiently at ever-increasing outputs. Floor space, operating overheads and downtime must be minimized. Other manufacturers look for very flexible lines with a more modest output. These depositors allow them to operate in different market sectors, and react quickly to changes in demand. Lines have multiple mould sets to make different shapes, or change parts so that candies and lollipops can be made on the same line. For confectionery companies needing to maximize product variety, the Baker Perkins ServoForm™ depositor platform includes the Duo machine to produce hard candy and lollipops on a single line, and the Universal for hard and soft confectionery. Cooking equipment is also flexible and capable of quick recipe changes, often on-the-run. There is also an increasing demand for more hygienic production lines which are easier to clean and maintain. Stainless steel is now used routinely throughout the depositor, not just in food contact areas. Automatic depositor washout systems are also being introduced, and can be very beneficial in reducing downtime and manpower.